EYA 923 was new in 1939. She is a Leyland Cheetah LZ5, with Harrington C31F body, complete with the tailfin, and we see her at Amberley during the Harrington Gathering on 3 June 2012. Some confusion creeps in about her origins, as I have seen mentions in different places of Blue Motors of Minehead, Blue Motors of Porlock, and others, but the rear view of this magnificent vehicle should settle that! Harringtons were one of those coachbuilders who produced bodywork with a curved waistrail which fell away sharply towards the rear end, as amply demonstrated here. Am I correct in thinking I’ve read somewhere that one of the functions of the dorsal fin, if not it’s main purpose, was to provide a little extra headroom for passengers who wished to access the rear seats? You may be right, Chris, and thank you for your comment. My understanding has always been that it was associated with ventilation. Yes, that is my understanding too.. Not apparent here, it widens out as it joins the roofline providing space for a head! Ventilation is a secondary function. Porlock Weir, Blue Motors base, is just outside mine head, so it would appear that Minehead, out of which excursions were operated aids those without detailed geographical knowledge! Unusually there is no phone no, but when the coach first entered service, there weren’t many phones . . .
Thomas Harrington applied for a patent on 5th November 1935, granted as 461026 in February 1937, for which the preamble said "It is usual nowadays to streamline motor coaches and one result of this is that difficulties are experienced in providing sufficient headroom along the central gangway, and an even more important consideration is the provision of adequate ventilation of motor road coaches which presents its special difficulties. The object of our inventor is to provide a motor coach of pleasing appearance which will also have more adequate ventilation and improved headroom and which will moreover lead itself to more effective internal lighting". The detailed specification went on describe how this was accomplished, and the diagram shows the familiar dorsal fin. So, Chris and Peter are both right !! The Harrington Dorsal Fin was patented as a ventilation device but it also added headroom in mid gangway on designs such as this one. Nice to see it in such good condition. I wonder just how suitable the Lynx chassis was for coach operations, normally well-filled with passengers, especially in the challenging byeways of North Devon. The TS8 would surely have been a better choice. Chris, various Bedfords and Fords (and other "lightweight" models) were the choice of many independent (and some "combine") tour operators in later years. No doubt tour coaches were subject to less "stresses-and-strains" as they didn’t have to stop/start as frequently as service buses, nor were they subject to such prolonged "hammering" as express coaches. True, a Tiger might have romped up the Devon hills quicker – but is that what the punters would have paid their money for? And no doubt a Cheetah cost less up-front than a Tiger, and so could be replaced earlier in its life. With reference to what Chris and Philip were saying the worry for me would be going _down_ the Devon hills in a Cheetah. However it was fairly successful as a lightweight full-size coach within its limits, much more so than the AEC Regal II. My chief fear would be to be going down the Devon hills pursued by a Cheetah…..
Rob’s comment reminds me of the look on the face of one of the St Andrew’s Ambulance crew on the Sunday of Glasgow Vintage Vehicle Trust’s open weekend when I said I had to run as I had a Western Leopard to catch. It is worth noting that the term "observation Coach" painted on the rear display of EYA 923 refers to another Harrington patented feature – a floor-line rising in steps towards the rear of the vehicle allowing passengers improved vision over the heads of those in forward seats. 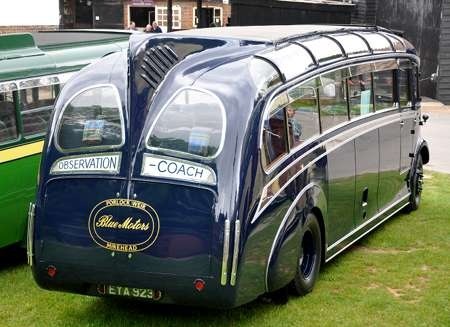 All coachwork styles with this feature were officially called called Observation Coach, while the style illustrated tended to be called a "Torpedo" to differentiate it from others. 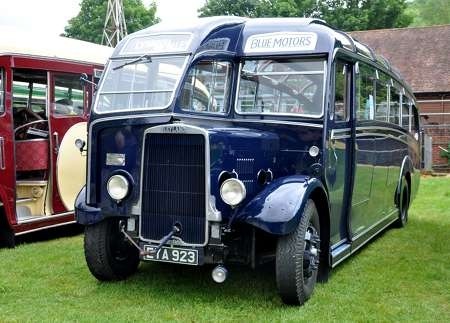 This attractive swooping waist rail design was not the most numerous of the immediate pre-war Harrington production and it strikes me was probably lighter, for although it was available on heavyweight chassis such as the AEC Regal, was most likely to be found on lighter ones, such as Leyland Cheetahs and Cubs. Blue Motors HQ and main garage was in North Road at Minehead, under what is now a block of flats. A small sub-depot existed at Porlock Weir, some 8 miles from Minehead and this building (which still stands) was capable of holding two of their vehicles. For a long period Blue Motors operated the Porlock Weir – Porlock – Minehead bus service hence the out-station. I was put on a coach as a young lad with a tail-fin… at ‘The Bakers Arms’ Stratford in East London in the early fifties. I don’t know where the Journey began but it stopped at the Bakers Arms above…then in Saffron Walden in Essex and I guess finished in Haverhill Suffolk. I’m wondering if any other manufacture made a coach with a tail-fin as I always had the impression it was a Bedford coach. Also have to say I think I thought it quite disappointing inside, not modern at all, also I’m sure the clock inside was Art Deco!! only a kids impression as it was about 67 years ago. Looking at the Harrington Body numbers I can find no Dorsal Fins with a Bedford Chassis. They appear to be Leyland AEC Foden and Commer.